This summary has been prepared by BargainWheels.com.au as a guideline to alert you to the key inclusions, exclusions, requirements and other terms and conditions which may apply when renting from this supplier. Customers will be required to accept Europcar Rental terms when collecting the vehicle. Credit Card charges will incur a 1.18% surcharge for Visa, 1.24% surcharge Mastercard. AMEX will incur 3.74 and Diners will incur 1.65%. Liability Reduction Options, please see our. Please see our Damage Liability Fee Guide below for further details. Pre-authorisation (security deposit) of $100 plus the cost of rental for accepted credit cards, $400 plus the cost of rental for debit Mastercard and Visa. Further information can be found below under “deposit”. Deposit for credit card payment is $100 plus the cost of rental. Extra kilometre charges – apply over the included figure will be charged at $0.275* – $0.36* AUD per kilometre traveled over the quoted threshold. This additional charge is payable to Europcar on return of your vehicle and calculated by the kilometres traveled at the applicable per-kilometre charge. GPS $15.40* per day GPS are subject to availability and can not be guaranteed (capped at 10 days $154.00*). Extra Driver can be added to the rental at an extra charge of $5.75* per extra driver per day capped at 5days. Max 4 additional drivers. NOT Probationary/Provisional P Plate Licence holders. Additional rental ‘extras’ selected at the Europcar Counter incurs an Administration fee of 3.85%, Premim Location fee, and Credit Card Surcharge. i.e. GPS Units, fuel, extra drivers (see below for charges). The liability amount on a GPS unit is $275* including GST, which can not be reduced. May change the original quoted price. For details on how to modify your booking please click My Booking. Accurate flight Details and Flight arrival time are extremely important. Correct details are a requirement of suppliers to guarantee the reservation. Delays will occur if the incorrect details are added to the reservation. Europcar policy is to offer a 2 hour holding procedure. Further delays need to be advised by contacting Europcar on 1300 13 13 90 to ensure the reservation is held.Hint: if you are delayed – visit the counter of the supplier at your departing airport. A mobile, or landline is mandatory for confirmation. Europcar Staff will need this to contact you if your arrival is delayed. Incorrect information may jeopordise your reservation. Europcar Asia Pacific accepts all recognised major credit cards including Visa, Mastercard, Bankcard, American Express and Diners Card. The credit card used for payment of the rental must be in the renters name and embossed on the front of the card. The renter’s signature must appear on the back of the card. Renters under 25 as well as renters of 4WD and Luxury vehicles must present a credit card on arrival. $400 plus the cost of rental for accepted debit Mastercard and Visa. Credit Card: The pre-authorisation will continue to be automatically released by the customer’s bank within a standard period of 3 to 14 days (some building societies may hold up to 30 days) after the rental has been closed. Debit Cards: the $400 pre-authorisation amount plus any extras that are not included in your voucher will be frozen on your card as security. Please note it may take your bank 7-21 days to release the $400 pre-authorisation amount. The $400 pre-authorisation amount plus any extras that are not included in your total cost will be frozen on your card as security. Please note it may take your bank 7-21 days to release the $400 pre-authorisation amount. The following payments are not acceptable when renting Prestige vehicles. – Cash or cheque payments. Europcar will not be responsible for any overdraft fees or other bank fees as a result of this policy. The Visa Credit card logo is the standard silver hologram of the Visa ‘Dove’, this can be found either on the front or back of the Credit card. This hologram indicates to staff that the card is a “credit” card. Debit cards do not have the hologram. Debit cards are NOT accepted by Europcar at this time. The standard Visa logo will be located on the front of the card and is the word “VISA” in blue and gold. Any other co-branded cards from MasterCard or Amex (yet). Single branded CUP cards (yet) see examples below. Single branded CUP credit cards and single branded CUP debit cards are NOT yet accepted by Europcar. 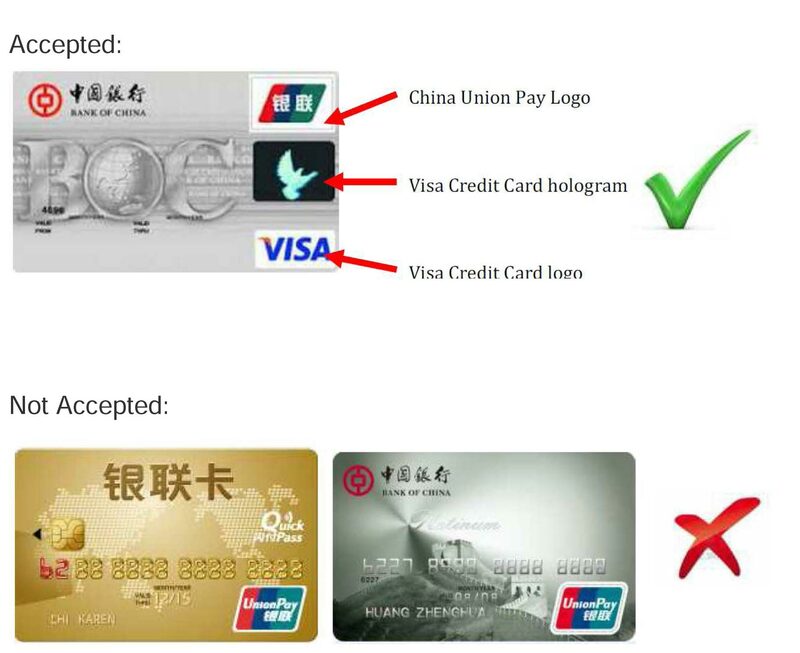 Single branded China Union Pay credit cards are produced by China with no co-operation with any other party. Single branded CUP debit cards have a CUP logo only. See example’s shown below. They do not have a hologram, or any other bank logo. Europcar will accept debit cards embossed with the Visa or Mastercard emblem (van, luxury and specialty fleet excluded). If a debit card is presented Europcar will charge your client a security bond of $400AUD or $400NZD plus the full rental costs. The security deposit will be returned when you return the car subject to no new damage and a full tank of fuel. The refund can take from around 7 -14 days, (some building societies may hold up to 30 days) after the rental has been closed. Europcar will accept debit card in limited circumstances on some standard passenger vehicles (not luxury, specialty or vans). Payment by debit card requires a bond to be paid at the start of the rental, and refunded on return. Please reply to the confirmation email requesting deposit information – our team will contact the depot for you and advise by return email in 1 business day. Alternatively, contact Europcar reservation centre on 1300 13 13 90 to find out more. Cash, Debit and Letter of Authority payment not accepted for Prestige or Luxury fleet. Drivers must hold a full licence to rent a vehicle from Europcar. Probationary or restricted licences are not acceptable. Photocopies are not acceptable. International arrivals into Australia or New Zealand are recommended to have arranged an International Driver’s Permit before travel and provide it with their current country licence. Europcar will accept a licence from the originating country providing it is in English and clearly demonstrates the expiry date, drivers address and permit conditions. Licences that are not in English will not be accepted without an international drivers licence. For identification purposes, we also require drivers to provide their credit card details. Photocopies of credit cards are not acceptable as a form of ID, the original card must be presented. You have not within the three years prior to the Rental Period on Part A been convicted of an offence relating to driving a vehicle under the influence of alcohol or drugs; or with a blood alcohol level over any legal limit. You are 21 years of age or over (higher age limits may apply on some vehicle classes). You must hold a valid current unrestricted motor vehicle driver’s licence for the particular class of vehicle hired (learners permits and provisional or probationary licences are not acceptable). You have not been refused nor had any motor vehicle insurance cancelled for any reason within the three years prior to the Rental Period on Part A. An additional driver is someone who is not “The Renter” but is someone the renter is giving permission to drive the vehicle as an “Authorised Driver”. Any additional driver’s need to show their Drivers Licence at the time of rental. Every additional driver is charged an additional driver fee of $5.75 inclusive of GST per day. This is capped at 5 days per additional driver. The minimum age for all drivers is 21. Drivers aged 21 to 24 are restricted to the types of vehicles they can hire, please contact phone number 1300 13 13 90 for details on Europcar rentals. All Drivers under the age of 25 are subject to a daily age surcharge of $30.25* inclusive of GST. Europcar have reversible baby seats and booster seats available for all passenger vehicles. They are required by law between the ages of 0 – 7 years. Baby and booster seats are on request and are required to be confirmed prior to travel. Europcar does not supply baby capsules, only reversible baby seats and a foam version booster seat. The type of child restraint used depends on the age and size of the child. The driver is responsible for ensuring that the child restraint has been adjusted according to the child’s size and weight and fitted correctly to the vehicle. We encourage all partners to advise customers prior to travel to check that the child seat is secured to their satisfaction. A summary of the laws for AU and NZ relating to child restraints is outlined in the table below. 7+ years: Drivers and passengers must wear safety belts when available. Europcar have portable GPS Units which can be fitted to any vehicle. GPS units must be pre-booked at the time of reservation and are available in all major cities for airports and downtown locations. GPS units may be taken one way; however fees and charges may apply if a customer fails to return or damages a GPS. The repair/replacement cost for the GPS unit is $275.00 (inc gst.) This charge will apply, regardless of whether the customer has purchased GoZen, CDW etc. When you rented your vehicle you entered into an agreement with RMS to provide you with the E-Toll Tag facility. The E-Toll Tag facility Terms and Conditions will be provided to you at the time of hire and are also available on www.myetoll.com.au/europcar. E-Toll Tag facility which enables you to pay tolls electronically. Your personal e-tag cannot be used in a Europcar rental vehicle. Please request a Shield Bag to place your personal e-tag so it does not register when driving through toll gates. For each calendar day on which your rental vehicle incurs a toll using your E-toll facility a service fee of $3.30 per day will be charged. You will not be charged a service fee for the days you don’t travel on a toll road. For example, if you hire a rental vehicle for three days using a credit card and then drive on toll roads for only two out of three days, you will only be charged a $6.60 service fee plus the accrued toll charges. Details of these fees are also included in the E-Toll Tag facility Terms and Conditions that were provided to you at the time you rented your vehicle. How do I check my charges? You can check all fees and toll charges online at www.myetoll.com.au/europcar. Where you can and cannot drive the vehicle – driving restrictions. without Europcar’s prior written consent, use the Vehicle to carry any inflammable substance which has a flash point under 23 or any other explosive or corrosive substances. transport any animal inside the Vehicle [except with the permission from the Owner and subject to all necessary approvals, permits, licenses and government requirements (to be obtained at Your own cost)]. An additional vehicle cleaning charge as specified in Part A will apply. operate or permit the Vehicle to be operated in breach of any legislation, regulations, rules or by laws relating to road traffic and use. in New Zealand operate the Vehicle or permit it to be operated in breach of the Transport Act 1962, the Traffic Regulations 1976, or any other Act, regulations, or bylaws relevant to road traffic. in New Zealand use the Vehicle for the carriage of hazardous goods (as defined in sections 70E to 70H of the Transport Act, as amended 1 May 1990). (j) on the road from Jim Jim Falls to Twin Falls in the Northern Territory, even if Unsealed Road Cover – 4WD or Unsealed Road Cover – ALWD has been purchased. unless the Vehicle is a 4WD and You have purchased Unsealed Road Cover – 4WD and You have hired a second spare wheel from Us. then you can drive on the roads listed above in points 2 (a) and (b). ii) On flood prone roads or any roadway where the Police or any other Government authority have issued a warning or caution. If You do not select the Prepaid Fuel Option (where available), and You return the Vehicle with less fuel than it had when You rented it, You must pay the refuelling service fee. GOZEN* Includes SCDW + WWI (formerly know as Super Piece of Mind SPOM).Available for passenger and small AWD vehicles. Premium cover option, reduces the Damage Liability Fee to nil. From $53.90* per day (1-3 day rentals) reducing for longer rentals (eg from $19.80* per day for 16 days +). Includes Windscreen, Wheels and Iridescences (WWI). Not available for: Large 4wd and Prestige vehicles. AWD/4WD Cover available for the SFDR vehicle for $16.50* per day which allows the driver to drive this vehicle on an approved unsealed road . Snow Cover available for $27.50* per day which allows the driver to drive this vehicle their vehicle above the snow line. GOZEN* Includes SCDW + WWI. Available for passenger and small AWD vehicles. Premium cover option, reduces the Damage Liability Fee to nil. From $63.80* per day (1-3 day rentals) reducing for longer rentals (eg from $30.80* per day for 16 days +). Includes Windscreen, Wheels and Iridescences (WWI). Not available for: Large 4wd and Prestige vehicles. SCDW (Super Collision Damage Waiver) not available for this group. GOZEN* Includes SCDW + WWI (formerly know as Super Piece of Mind SPOM). Not available for this group. AWD/4WD Cover available for $16.50* per day which allows the driver to drive this vehicle on an approved unsealed road. GOZEN* Includes SCDW + WWI (formerly know as Super Peace of Mind SPOM).Not available for this group. SCDW (Super Collision Damage Waiver) – from $50.60* per day. This package reduces the Damage Liability to $605.00. GOZEN*Includes SCDW + WWI. Not available for this group.